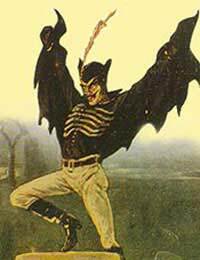 The legend of Spring Heeled Jack has been around since the Victorian era. This character of English folklore is said to be able to leap very high. Those who have seen him say he is tall, thin, and having features, which resembled the devil. Some say he has claws on his hands and can breathe flames. Even others say that his eyes resemble balls of fire. The first sighting of Spring Heeled Jack occurred in 1837 in London. A businessman who was returning home from work late one night reported seeing a mysterious figure that jumped over the high railing of a cemetery. Spring Heeled Jack did not attack or harm the businessman in any way, other than to give him quite a scare! However, the description the businessman gave of what he saw was terrifying – a muscular man with large pointed ears, a pointed nose, and glowing eyes. Later that same year, a young girl named Mary Stevens was walking to Lavender Hill. As she walked through Clapham Common, a strange figure leapt out at her. He grabbed her tightly and began kissing her. He started ripping her clothes and touched her with what she described as claws “cold and clammy as those of a corpse.” The girl screamed and fled. Several residents searched, but found no one meeting that description. The next day, Spring Heeled Jack attacked another victim. This time, he did not physically attack a person, but the carriage they were riding in. The coachman lost control, crashing the carriage, while Spring Heeled Jack jumped over a nine-foot wall to escape. The Lord Mayor of London, Sir John Cowan, read a complaint by an anonymous resident of Peckham regarding Spring Heeled Jack. It told of a wager for someone to appear in disguises near London and play pranks on residents. The prank seemed to be confirmed by a member of the audience. The matter was reported to The Times and other national papers. More and more letters of “wicked pranks” occurring around the land poured into the Lord Mayor’s office. One even said that in Stockwell, Brixton, Camberwell, and Vauxhall, people had not only been having fits after seeing Spring Heeled Jack, but some had died of fright. The Lord Mayor instructed the police to search for the individual responsible, offering a reward if he was captured. Lucy and her sister were walking along Green Dragon Alley, when a character attacked her. He reportedly blew fire into her face then left. Lucy had spasms for hours after the attack. After the attack on Jane appeared in the headlines of the newspaper, Thomas Millbank was arrested and tried after he claimed to be Spring Heeled Jack. The trial was held at Lambeth Street court. Although there was some evidence to prove that he was Spring Heeled Jack, Millbank was eventually acquitted when Jane insisted that the attacker blew fire into her face and Millbank admitted he could not do that. The legend of Spring Heeled Jack began to grow. He was the subject of several penny dreadfuls, nineteenth century British fiction publications. There were also plays performed which featured him. But, as his fame grew, his appearances began to decrease. The End of Spring Heeled Jack? In 1872, Spring Heeled Jack was seen Peckham, then in 1873, he was seen in Sheffield. In 1877, a group of soldiers reported seeing him in Aldershot’s barracks. One soldier shot at him after he attacked a sentry, but Spring Heeled Jack just spat blue flames at them and disappeared into the dark. Later that year, he was seen in Newport Arch, in Lincolnshire. It was reported that residents there cornered him and shot at him, again with the shots having no affect on him as he leaped out of sight. In 1904, he was seen in western England in Everton, in north Liverpool on the top of the Saint Francis Xaviers Church. After the beginning of the twentieth century, reports had died down. However, in the 1950s, there were reports of Spring Heeled Jack being seen in Houston, Texas. In 1986, a travelling salesman in South Herefordshire reported seeing a figure that matched the description of Spring Heeled Jack. Some think that the sightings of Spring Heeled Jack were merely a case of mass hysteria. Still others think that he was less supernatural and more the pranks of a group of young men. Even others think that perhaps he was an extraterrestrial or even a demon accidentally summoned by those practicing the occult. Regardless of whether he is real or not, Spring Heeled Jack is a figure that often appears in pop culture, from Thomas Haines’ 1840 play (Spring Heeled Jack, the Terror of London) to an episode of Jackie Chan Adventure.